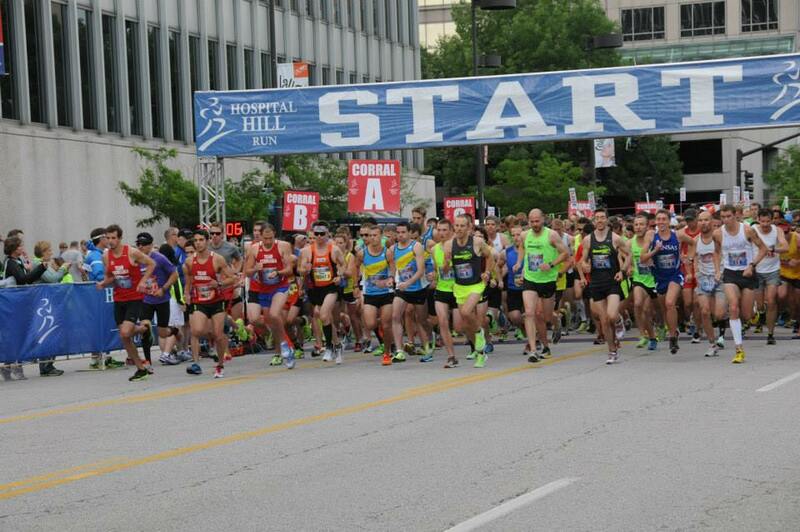 The UMKC Health Sciences District is once again pleased to serve as an event sponsor for one of the oldest and most-storied races in Missouri: the 46th Annual Hospital Hill Run, which returns to Kansas City on Saturday, June 1. This year’s race event will take place on one day, with the starting and finishing lines for all three race distances – 5K, 10K, and half marathon – set up at Kansas City’s Crown Center. Through the sponsorship, all UMKC running enthusiasts, faculty, staff, students and alumni may receive a 20 percent discount on registration for any race distance. Just use the code: UMKCDISC19. Register here. Over the years, more than 170,000 athletes of all levels from across the world have participated in this event. Originated by UMKC School of Medicine founder Dr. E. Grey Dimond, M.D., the Hospital Hill Run served as host to the first USATF National Championship half marathon in 2002. In 2013, the race was recognized by Runner’s World Magazine as the 11th best half marathon in the United States. UMKC faculty, staff, students and alumni who aren’t participating in the races may serve in one of many volunteer roles. Volunteers are the backbone of the Hospital Hill Run. Individuals and groups are needed to help unwrap medals; pack post-race food packets; sort, stack, and pass out t-shirts; distribute race bibs; set up and staff aid stations; cheer and steer participants on course; award medals; hand out wet towels, food, and hydration at the finish line; and help with event clean up. Volunteers may register here. Nearly 2,900 runners outlasted the weather on June 2 to take part in the 2018 Hospital Hill Run that was sponsored by the UMKC Health Sciences District. From extreme heat on Friday to high winds and a menacing storm front early Saturday, the weather caused big worries just before the 2018 Hospital Hill Run, sponsored by the UMKC Health Sciences District. But after the starting horn sounded at 7:30 Saturday morning, June 2, cloudy skies and temperatures in the 60s prevailed, making it a good day for the races. Mid-90s heat caused the usual Friday evening 5K to be pushed to 7 a.m. Saturday, when the 7.7-mile and half-marathon races also were to begin. Because of lightning and a brewing storm, that start time was delayed an additional 30 minutes. But the big storm never materialized along the race routes, and all three runs started and finished in good order at Crown Center. This was the 45th year for the race, which drew more than 2,800 entrants for its three distances, and the first year for the UMKC Health Sciences District to be the lead sponsor of the race. Several of the dozen institutions that make up the district also provided the physicians, nurses, students and other health care professionals to staff the medical tent for runners in distress. The cool weather helped, and just more than 30 runners ended up needing any medical help. School of Medicine students, residents and faculty joined health care professionals from across Hospitall Hill to man the medical tent at the 2018 Hospital Hill Run. Gibson, who has worked the race for nine years, said 50 to 100 people needing help on race day is more typical. She and her staff were ready for much worse. The medical tent was stocked with cots, ice packs, bandages and even an iced-down tub to treat the worst cases of overheating. One of the residents, Cassie From, D.O., packed as much as she could into the morning. She ran the 5K before helping staff the tent. The unique UMKC Health Sciences District is made up of UMKC; its Schools of Dentistry, Medicine, Nursing and Health Studies, and Pharmacy; Children’s Mercy Kansas City and Truman Medical Centers; the Kansas City (Mo.) Health Department; the Missouri Department of Mental Health Center for Behavioral Medicine; Jackson County Medical Examiner; Diastole Scholars’ Center; and Ronald McDonald House Charities of Kansas City. The Hospital Hill Run was started by E. Grey Dimond, M.D. He also founded the UMKC School of Medicine, which in recent years sponsored the 5K. The UMKC Health Sciences district became the lead sponsor for all the races shortly after the district was founded a year ago. The race weekend usually draws top runners from around the country, plus many local participants, often from fitness groups. That was the case Saturday for about 15 runners from the Sunday Runday North contingent. They met, stretched, chatted and watched the sky for a while at Crown Center before heading to the starting line. One member of the group, Matt Kaspar, said this was his first Hospital Hill, and he chose the 7.7-mile race. Perhaps helped by the weather, the division winners in all three races turned in good times. The first to cross the finish line in the 5K race was Zach Grover, 18, of Lee’s Summit. He won the men’s division in 17:17, followed 13 seconds later by his younger brother, Dylan Grover. Jennifer Butler, 29, of Overland Park, won the women’s division in 22:13. The race had 380 entries. Zan Johnson, 20, of Olathe, won the men’s division of the 7.7-mile run in 45:12, and Jamie Martens, 42, of Mission, Kansas, won the women’s division in 54:53. That race had 1,004 entries. An hour and 10 minutes (and 9 seconds) after the starting horn, the half marathon winner crossed the finish line: Austin Bogina, 24, of Arma, Kansas. The women’s division winner, Elle Meyer, 32, finished in 1:21:43. The half marathon had 1,487 entries. Full race results, along with other information, are available online. Organizers of the 2018 Hospital Hill Run and presenting sponsor, UMKC Health Sciences District, are providing a series of video training tips to help participants prepare for the Friday and Saturday event on June 1-2 in Kansas City. One of the most storied road race events in Missouri, it includes a Friday night 5K run and the Saturday 5K rerun, 7.7-mile run and half-marathon. Go to the Hospital Hill Run YouTube page each Tuesday from now until race weekend for a new video with tips from local sports medicine doctors and trainers on a wide variety of topics. These will look as topics such as running and exercising as a family, staying hydrated during and after training, and preventing running injuries. In addition to improving your health and wellness, participation in the Hospital Hill Run supports many local charities. This year’s run will benefit the School of Medicine’s Sojourner Health Clinic, a student-run, free safety-net clinic helping the adult homeless and medically indigent in Kansas City. Volunteers are needed at all events, from handing out race packets, to cheering on athletes, to handing out medals at the finish line. Learn how you can get involved by visiting the Hospital Hill Run web site. All UMKC staff, faculty, students and alumni may register at a discounted rate or serve as volunteers. Participating staff and faculty can also earn points toward their wellness incentive programs. When registering for the Friday night or Saturday morning race events, use the code SOM2018DISC for 20 percent savings. Athletes and volunteers: Take part in the 2018 Hospital Hill Run presented by UMKC Health Sciences District! Fourth-year medical student Jordann Dhuse, winner of the women’s 5K event at the 2017 Hospital Hill Run, and running enthusiast and professor of emergency medicine Stefanie Ellison, M.D., talked to Kansas City’s 41 Action News about training for the 2018 Hospital Hill Run. 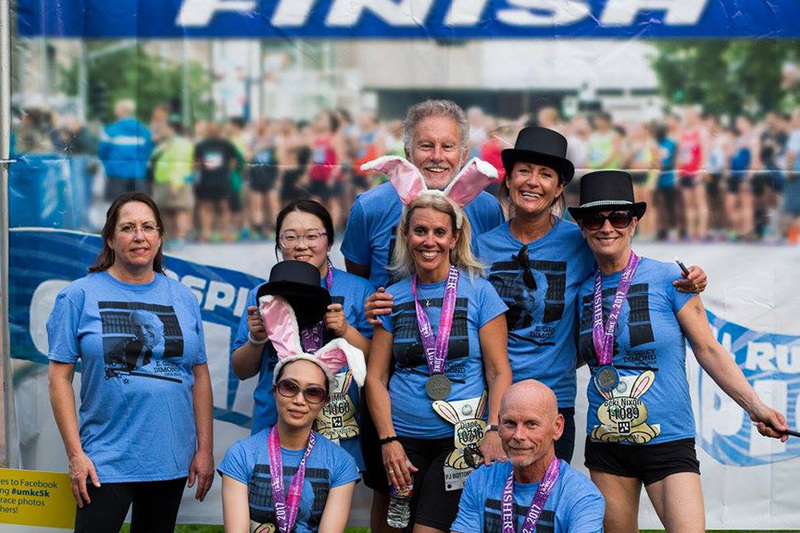 The UMKC Health Sciences District is the presenting sponsor for the 2018 Hospital Hill Run – one of the most storied races in Missouri history – on June 1-2, 2018. Race weekend begins with a 5K run on Friday night – where strollers are welcome and families of all sizes are encouraged to take part. The next morning, runners hit the pavement in the 5K rerun, 7.7 mile and half marathon. In addition to improving your health and wellness, your participation in the Hospital Hill Run supports many local charities, including the School of Medicine’s Sojourner Health Clinic, a student-run, free safety-net clinic helping the adult homeless and medically indigent in Kansas City. And volunteers are needed at all events, from handing out race packets, to cheering on athletes, to handing out medals at the finish line. To learn how you can get involved in this year’s race, visit http://www.hospitalhillrun.com/. The School of Medicine has served as sponsor of the annual Hospital Hill Run 5K race. It is part of the new UMKC Health Sciences District that has agreed to be the presenting sponsor for the full 2018 Hospital Hill Run event. The UMKC Health Sciences District has agreed to serve as presenting sponsor for the 2018 Hospital Hill Run scheduled for June 1 and 2 in downtown Kansas City. Hospital Hill Run has a long history with many of the health care providers and facilities that comprise the UMKC Health Sciences District. Partnership in the city’s oldest running event is a natural extension of those existing relationships. Thinking of taking on the Hospital Hill race? Formed in 2017, the UMKC Health Sciences District is a partnership of 12 neighboring health care institutions on Hospital Hill: the University of Missouri-Kansas City and its School of Medicine, School of Nursing and Health Studies, School of Pharmacy and School of Dentistry; Truman Medical Centers; Children’s Mercy; Kansas City (Mo.) Health Department; Missouri Department of Mental Health Center for Behavioral Medicine; Jackson County Medical Examiner; Diastole Scholars’ Center; and Ronald McDonald House Charities of Kansas City. The district collaborates on research, grants, community outreach and shared wellness for employees, faculty, students and surrounding neighborhoods. Now in its 45th year, Hospital Hill Run has been host to world-class runners, Olympians and more than 170,000 athletes of all levels from across the globe. This new partnership ensures that Hospital Hill Run will continue to enhance its legacy as one of the premier endurance events in the United States. The Hospital Hill Run began in 1974 with 99 athletes paying a $1 registration fee to run a 6.8-mile course at Crown Center. Today, it has evolved into a weekend event that hosts thousands of athletes over two days and three different event distances. The event now includes three distances: a Friday night 5K fun run, followed by a 7.7-mile and a half marathon on Saturday morning. Those who wish to challenge themselves further can compete in both the 5K on Friday night and either the 7.7-mile or half marathon on Saturday, called the Hospital Hill Run Re-RUN. All events begin and end on Grand Boulevard directly in front of Crown Center. A two-day health and fitness expo at the Crown Center Exhibit Hall, a Pasta Party, and two post-race parties open to all will round-out race weekend. In 2017 The Hospital Hill Run Foundation made a $25,000 donation to the Kansas City Police Action League, the 2018 donation will be announced soon. Jordann Dhuse shared her division winner’s medal with her dog, Milo. 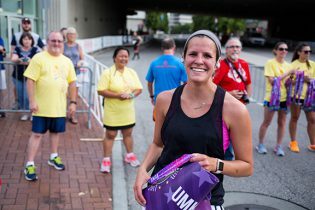 When fourth-year student Jordann Dhuse crossed the finish line at the 2017 UMKC School of Medicine 5K, she wondered what all the fuss was about. “I was shocked when I realized I had won my division,” said Dhuse, first among the 930 women in the June 2 race. Dhuse runs more “as a way to decompress from studying” than to be competitive, she said. But she does push herself to improve, and her time in this year’s 5K, 23:11, was almost two and a half minutes better than a year ago, when she placed 30th in the women’s division. “I try to fit in a run most days, three miles if I’m lucky,” she said, and often can be seen running near the school, or walking her dog, Milo. It was the fourth year that the 5K took place the Friday evening before the Hospital Hill 10K and Marathon. The move was made to make the shorter race more family friendly, and it draws parents pushing strollers, along with many teams from various workplaces and non-profits. UMKC School of Medicine advancement director Fred Schlichting congradulates Jordann Dhuse. Dhuse is from the Chicago area and came to UMKC after earning a bachelor’s degree in health science at the University of Missouri. Then Dhuse decided to go on for a medical degree and was happy she was accepted at UMKC. Members of Team Dimond represented the School of Medicine and founder E. Grey Dimond, M.D., at the 2017 Hospital Hill Run’s UMKC School of Medicine 5K race. Two prominent figures from the UMKC School of Medicine were introduced into the new Hospital Hill Run Hall of Fame on June 1 during a VIP reception just prior to race weekend. The inaugural class of inductees includes the two founding fathers of the Hospital Hill Run, UMKC School of Medicine founder E. Grey Dimond, M.D., and retired faculty member Ralph Hall, M.D. Mark Curp, a local two-time Hospital Hill Run winner who held U.S. and world records in the half marathon from 1985 to 1990, was also part of the inaugural Hall of Fame class. During the past 44 years, the race has grown from a single, 6.8-mile race with fewer than 100 runners to an annual event that boasts thousands of athletes competing in three different distances. Annually, it includes the UMKC School of Medicine 5K on Friday night, followed by a 10K and a half marathon on Saturday morning. Runner’s World magazine has touted the Hospital Hill Run as one of the top 25 road races in the United States. The 2017 races were held June 2 and 3 with each beginning and ending on Grand Boulevard directly in front of Crown Center. 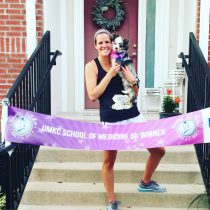 Fourth-year UMKC School of Medicine student Jordann Dhuse won the women’s 5K event. Jordann Dhuse, a fourth-year student at the UMKC School of Medicine, won the women’s division of the School of Medicine 5K event in 23-minutes, 11-seconds, more than 40 seconds ahead of the second-place finisher in the women’s race. More than 1,800 people took part in this year’s half-marathon, 10K and 5K events. Complete race results are available on the Hospital Hill Run website. 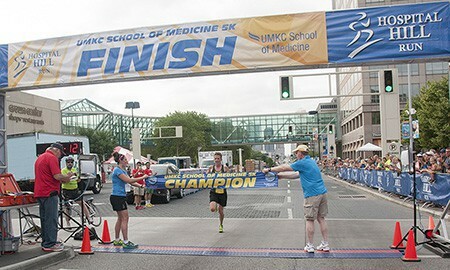 Visit the UMKC School of Medicine Facebook page for more photos from the 5K race. Dimond (1918-2013) was a devoted physician who dedicated his life to the practice of medicine, medical education and physical fitness. He scheduled a symposium of physical fitness to be held in May 1974 with the intent to combine the symposium with a running event. Dimond approached Hall, a UMKC faculty member and an endrocrinologist at Saint Luke’s Hospital, with the idea and together they created the Hospital Hill Run. For many years, Dimond experienced a great surge of happiness standing on the southwest corner of 25th and Holmes, cheering on thousands of runners as they competed in the event. Hall was a runner in high school and college but had never managed a running event. He used his running network to secure a race organizer. For the first few years, Hall managed the medical tent to ensure that all runners would receive proper care if needed. In addition, he worked with various physicians to incorporate medical education courses before moving from Kansas City. Racers packed the starting line for the UMKC School of Medicine 5K Run to kick off the 2016 Hospital Hill Run. The UMKC School of Medicine is the 5K sponsor of the 2017 Hospital Hill Run – one of the most storied races in Missouri history. Originally created by SOM Founder Grey E. Dimond, the race attracts thousands to participate or volunteer in the family friendly UMKC School of Medicine 5K, as well as the 5K rerun, 10K or half marathon. As the named sponsor of the UMKC School of Medicine 5K on Friday, June 2, at 7 p.m. – where strollers are welcome and families of all sizes are encouraged to take part – all UMKC staff, faculty, students and alumni may register at a discounted rate. Participating UMKC staff and faculty also may earn points toward their wellness incentive programs by racing or volunteering. When registering for the Friday night or Saturday morning race events, use the code DISCUMKC for 20 percent savings. In addition to improving your health and wellness, your participation in the Hospital Hill Run supports many local charities. There are many ways to get involved in this year’s Hospital Hill Run. Volunteers are needed for all events: to help unwrap medals; pack post-race food packets; sort, stack, and pass out t-shirts; distribute bibs; set up and staff aid stations; cheer and steer participants on course; award medals; give wet towels, food, and hydration at the finish line; and race clean up. 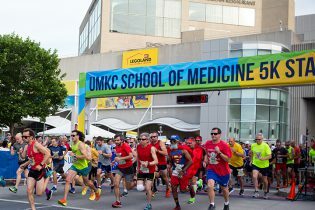 The UMKC School of Medicine 5K, part of the annual Hospital Hill Run, moved to a Friday night and drew nearly 1,900 entries for the June 6 race that started and finished at Kansas City’s Crown Center. Numerous School of Medicine volunteers served as support personnel for the event. 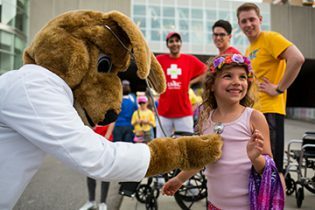 The first UMKC School of Medicine 5K race run at night drew a crowd of almost 1,900 participants to Crown Center on June 6 as part of the 2014 Hospital Hill Run. 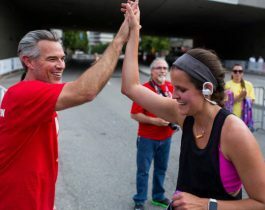 Race organizers this year changed the race date, moving it to Friday night on June 6, the night before the 10K and half marathon races races, in hopes of making it a more family-friendly event. The change paid off with pleasant weather for the 5K run that began and finished on Grand Blvd. in front of Kansas City’s Crown Center on Friday before rain and thunderstorms dampened the final two races of the weekend on Saturday morning. School of Medicine faculty, students and staff volunteers again served as support personnel for both days of the event, providing assistance at first aid stations located throughout the race routes and at the first aid tent. Sports medicine faculty and fellows provide medical services for the entire event. Derek Lee of Clinton, Mo., won the men’s 5K race for the second consecutive year and Nicole Lee of Clinton, Mo., won the women’s race. (Full results) This year’s Hospital Hill Run drew 6,647 participants for all races combined. 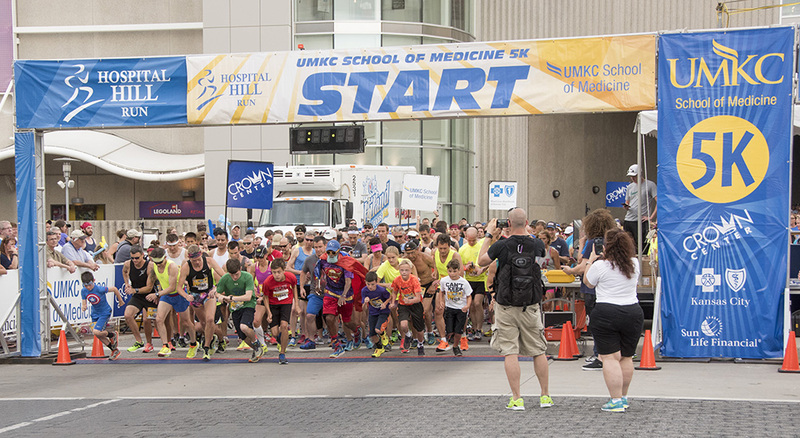 More than 7,500 runners participated in the 40th annual Hospital Hill Run in Kansas City on Saturday, June, 1, including more than 1,600 runners in the UMKC School of Medicine 5K event. Runners filled the streets of Hospital Hill on Saturday, June 1, for the 40th annual Hospital Hill Run, including more than 1,600 participants in the UMKC School of Medicine 5K event. Clear skies and mild weather lured a crowd of nearly 7,700 particpants and thousands of onlookers to the event that includes the 5K, 10K, half marathon and wheel chair race. The School of Medicine served as the title sponsor for the 5K run for the seventh straight year, and has been connected with the event since its beginning in 1974. School of Medicine Dean Betty Drees, M.D., and Senior Associate Dean Paul Cuddy, Pharm.D., manned the finish line banner for the 5K run, won by Derek Lee of Clinton, Mo., in 16 minutes, 17 seconds. Katie Berger of Smithville, Mo., won the women’s race in 20:17. The half marathon drew nearly 4,300 runners. Josh Baden of Lawrence, Kan., won the race in 1:10:05 and Kimi Reed of Brookline, Mo., won the women’s race in 1:19:21. 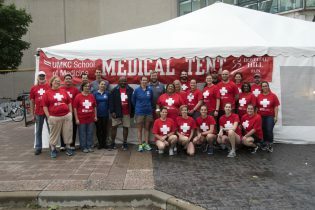 School of Medicine faculty, students and staff volunteer each year to serve at first aid stations located throughout the race routes and at the first aid tent. Sports medicine faculty and fellows provide medical services for the entire event.